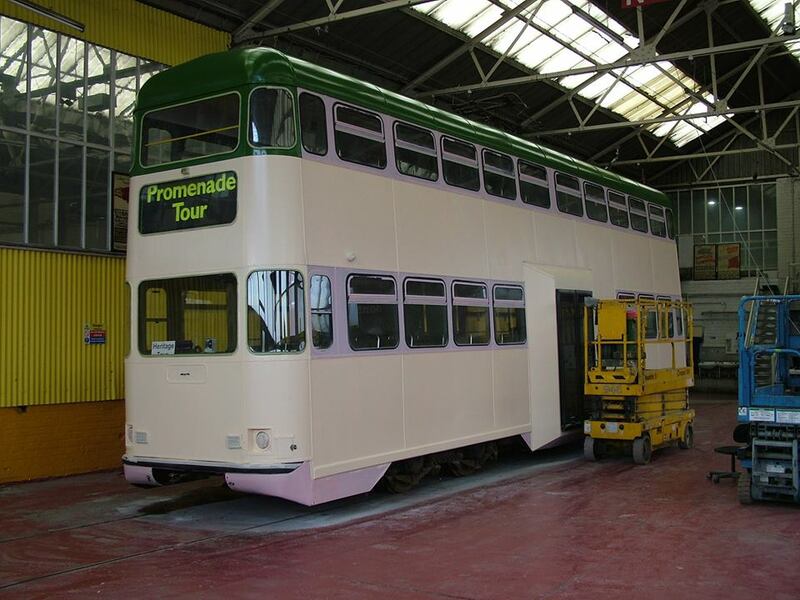 Since the inception of Blackpool Heritage Tram Tours, no two trams have ever been outshopped in identical liveries – but that is set to change imminently with the news that Rebuilt Balloon car 707 is being painted in the ‘Millennium’ style of green and cream which it received when first rebuilt with flat ends in 1998. This will be the same as that worn by similar 718, giving an almost matching pair of modernised Balloons! 707 has been out of service since 2013 but work to reactivate the car has been ongoing over the winter months, including a complete repaint. Preparatory work has been quite extensive, due to the shabby black base coat left behind after the removal of vinyls from its previous advertising livery for Coral Island, but the repaint is now at an advanced stage with a return to use for the tram expected soon. The livery will feature black window surrounds and a grey skirt – identical to 718, although there are a few differences between the two, most notably internally. Of all the four Millennium rebuilds, 707 has the most traditional interior with less use of modern laminates, and retaining the classic green moquette so associated with the Balloon class. Although the appeal of a second flat-fronted car to the general public is questionable, especially when the two will look so similar at a glance, 707 is likely to prove invaluable for illumination tour duties and a large, heater-fitted double-deck tram is always useful on cool autumn evenings, so 707 should be a welcome addition to the operational fleet this year. With the recent announcement that 704 is to be restored to 1950s condition, a good selection of Balloon cars representing this class over the years is being amassed in Blackpool to highlight the lengthy career enjoyed by these trams, and the many changes lavished upon them over eight decades – and 707 will be another pleasing addition to the collection. 2 Responses to Seeing double with 707 & 718! I have photographs of 707 as first turned out in 1998, at the Fleetwood Transport Festival that year, with no curved corner glazing to the upper deck. How long did it operate like that? My understanding is that the glass hadn’t been supplied in time for the car’s debut. I think 707 received the corner windows around winter 1999/2000, presumably around the time they were being fitted to 709 – I would imagine BTS ordered enough for two cars.